American all-solid orbital launch vehicle. Solid-fuel, light payload, lower-cost launch vehicle developed by the Air Force and NASA in the late 1950's and used in a variety of configurations over thirty years. Launched from Cape Canaveral, Vandenberg, Wallops Island, and from Italy's equatorial San Marco platform off Kenya. Italy studied but did not develop subsequent upgraded versions. AKA: SLV-1. Status: Retired 1994. The Scout was a four-stage, solid-fuelled rocket developed to provide the United States with a reliable, versatile and cost-effective launch vehicle for a variety of space exploration tasks - orbital, high altitude probe, and high speed re-entry. Developed by NASA, the vehicle was produced by LTV Aerospace's Missiles and Space Division, which also provides systems management. The first US solid-propellant rocket capable of placing payloads in orbit, Scout had important roles in the space programs of NASA and the Department of Defense plus those of the United Kingdom, Italy, France, Germany and the 10-nation European Space Research Organisation (ESRO). 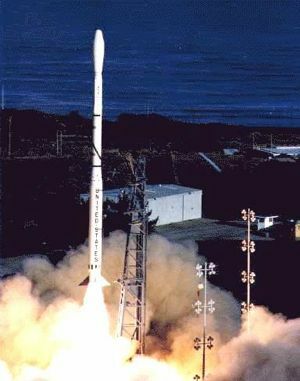 Scout was launched in the United States from NASA's Wallops Island, Virginia, and by Air Force crews from the Western Test Range in California. A third site - the Italian San Marco sea-based platform off the east coast of Africa-made possible launches along the equator. Early Scouts were capable of boosting less than 150 kg into a nominal 500-km orbit. Performance was increased by development of a fifth stage velocity package. Prime Contractor: LTV Aerospace Corporation, a subsidiary of Ling-Temco-Vought, Inc. Associate Contractors: Aerojet General (first stage); Thiokol Chemical (second stage); Hercules Powder Company (third stage); United Technology Center (fourth stage); Honeywell (guidance). Advanced Scout American all-solid orbital launch vehicle. Proposed upgrade of Scout proposed by the University of Rome with two strap-ons from the Ariane 4. Launch would have been from Italy's San Marco platform off Kenya. Further work cancelled in 1993. Air Force Scout RM-92 Ford Aeronutronics USAF launch vehicle. Blue Scout ERCS American strategic communications missile. USAF initial Emergency Rocket Communications System booster. Blue Scout I American suborbital launch vehicle. Air Force version of Scout used for suborbital tests. Blue Scout II American all-solid orbital launch vehicle. Air Force version of Scout used for suborbital and orbital military tests. Blue Scout Jr SLV-1B(m) American all solid propellant suborbital launch vehicle. Blue Scout Jr SLV-1C American all solid propellant suborbital launch vehicle. Blue Scout Junior American suborbital launch vehicle. Smaller Air Force version of Scout used for suborbital military tests. Scout A American all-solid orbital launch vehicle. All-solid low cost lightweight launch vehicle. Scout D American all-solid orbital launch vehicle. Family: all-solid, orbital launch vehicle. Country: USA. Spacecraft: Transit, GRAB, S-56, Injun, S-55, Radio Test Spacecraft, SECOR, Ariel, Program 35, GRS, ADE, ESRS, IE, Beacon, San Marco satellite, IQSY, FRANCE satellite, OV3, Owl, ESRO, Solrad, RM, AZUR, OFO, SAS, Eole satellite, SSS, MTS, TIP, AEROS, Miranda, Hawkeye, ANS, DAD, P 76, AEM, SAGE, Magsat, HILAT, ITV, Polar Bear, MACSAT, REX, SAMPEX, MSTI, Radcal. Agency: L.T.V./Ford Aeronutronics. Bibliography: 126, 159, 17, 2, 245, 249, 26, 279, 297, 42, 45, 483, 563, 572, 6. 1957 July - . LV Family: Scout. Launch Vehicle: Scout A. Beginning of the Scout launch vehicle concept. - . Nation: USA. A study was initiated by the Langley Aeronautical Laboratory on the use of solid-fuel upper stages to achieve a payload orbit with as simple a launch vehicle as possible. This was the beginning of the Scout test-vehicle concept..
1959 March 1 - . LV Family: Scout. Launch Vehicle: Scout A. Scout development begun. - . Nation: USA. "Poor man's rocket," Scout, was jointly announced by NASA and AF. The concept of Scout originated at Langley Research Center in 1958, based upon extensive experience with staged solid-propellant rockets..
1960 April 18 - . 23:09 GMT - . Launch Site: Wallops Island. Launch Complex: Wallops Island LA3. LV Family: Scout. Launch Vehicle: Scout X. FAILURE: Vehicle broke up after first-stage burnout.. Failed Stage: 1. Cub Scout test - . Nation: USA. Agency: NASA. Apogee: 48 km (29 mi). Scout test vehicle, with live first and third stages. Suborbital..
1960 July 2 - . 00:04 GMT - . Launch Site: Wallops Island. Launch Complex: Wallops Island LA3. LV Family: Scout. Launch Vehicle: Scout X-1. FAILURE: Failure. Test mission - . Nation: USA. Agency: NASA. Apogee: 1,380 km (850 mi). 1960 September 21 - . 13:01 GMT - . Launch Site: Cape Canaveral. Launch Complex: Cape Canaveral LC18A. Launch Pad: LC18A. LV Family: Scout. Launch Vehicle: Blue Scout Jr.
Blue Scout first launch, with Radiation Probe (HETS) payload. - . Nation: USA. Agency: USAF. Apogee: 26,700 km (16,500 mi). USAF Blue Scout rocket fired from Cape Canaveral placed instrumented payload 16,600 miles above the earth, the first of 11 such tests, but no data were received due to radio malfunction..
1960 October 4 - . 15:23 GMT - . Launch Site: Wallops Island. Launch Complex: Wallops Island LA3. LV Family: Scout. Launch Vehicle: Scout X-1. Radiation Probe Plasma mission - . Nation: USA. Agency: NASA. Apogee: 5,600 km (3,400 mi). 1960 November 8 - . 13:18 GMT - . Launch Site: Cape Canaveral. Launch Complex: Cape Canaveral LC18A. Launch Pad: LC18A. LV Family: Scout. Launch Vehicle: Blue Scout Jr. FAILURE: Failure. HETS Magnetospheric mission - . Nation: USA. Agency: USAF. Apogee: 200 km (120 mi). 1960 December 4 - . 21:14 GMT - . Launch Site: Wallops Island. Launch Complex: Wallops Island LA3. LV Family: Scout. Launch Vehicle: Scout X-1. FAILURE: Second stage malfunction.. Failed Stage: 2. Explorer (9) S 56 - . Payload: S-56. Mass: 6.00 kg (13.20 lb). Nation: USA. Agency: NASA. Program: Explorer. Class: Earth. Type: Atmosphere satellite. Spacecraft: S-56. Decay Date: 1960-12-04 . 1961 January 7 - . 17:33 GMT - . Launch Site: Cape Canaveral. Launch Complex: Cape Canaveral LC18B. Launch Pad: LC18B. LV Family: Scout. Launch Vehicle: Blue Scout I.
HETS A1-1 Plasma / radio astronomy mission - . Nation: USA. Agency: USAF. Apogee: 1,600 km (900 mi). 1961 February 16 - . 13:05 GMT - . Launch Site: Wallops Island. Launch Complex: Wallops Island LA3. LV Family: Scout. Launch Vehicle: Scout X-1. Explorer 9 - . Payload: S-56A. Mass: 7.00 kg (15.40 lb). Nation: USA. Agency: USAF. Program: Explorer. Class: Earth. Type: Atmosphere satellite. Spacecraft: S-56. Decay Date: 1964-04-09 . USAF Sat Cat: 81 . COSPAR: 1961-Delta-1. Apogee: 2,433 km (1,511 mi). Perigee: 757 km (470 mi). Inclination: 38.80 deg. Period: 118.00 min. 12 foot dia. balloon; atmospheric density studies. Spacecraft engaged in research and exploration of the upper atmosphere or outer space (US Cat B). .
1961 March 3 - . 16:02 GMT - . Launch Site: Cape Canaveral. Launch Complex: Cape Canaveral LC18B. Launch Pad: LC18B. LV Family: Scout. Launch Vehicle: Blue Scout II. HETS A2-1 Plasma mission - . Nation: USA. Agency: USAF. Apogee: 2,540 km (1,570 mi). 1961 April 12 - . 06:07 GMT - . Launch Site: Cape Canaveral. Launch Complex: Cape Canaveral LC18B. Launch Pad: LC18B. LV Family: Scout. Launch Vehicle: Blue Scout II. HETS A2-2 Plasma mission - . Nation: USA. Agency: USAF. Apogee: 1,931 km (1,199 mi). 1961 May 5 - . LV Family: Scout. Launch Vehicle: Scout A. Scout to evaluate the Mercury tracking system. - . Nation: USA. Spacecraft: Radio Test Spacecraft, Mercury. A document was issued regarding use of a Scout test vehicle to evaluate the performance of the Mercury tracking and real-time computing system. NASA Headquarters tentatively approved the plan on May 24, 1961..
1961 May 9 - . 16:00 GMT - . Launch Site: Cape Canaveral. Launch Complex: Cape Canaveral LC18B. Launch Pad: LC18B. LV Family: Scout. Launch Vehicle: Blue Scout I. FAILURE: Failure. HETS A1-2 Plasma mission - . Nation: USA. Agency: USAF. Apogee: 10 km (6 mi). 1961 June 13 - . LV Family: Scout. Launch Vehicle: Scout A.
Mercury-Scout instrumentation system. - . Nation: USA. Spacecraft: Radio Test Spacecraft, Mercury. The Space Task Group forwarded to NASA Headquarters the details for the Mercury-Scout instrumentation system. This mission was to check the operational effectiveness of the Mercury global tracking network..
1961 June 30 - . 17:09 GMT - . Launch Site: Wallops Island. Launch Complex: Wallops Island LA3. LV Family: Scout. Launch Vehicle: Scout X-1. FAILURE: Third stage did not ignite, and the vehicle was destroyed.. Failed Stage: 3. Explorer (13) S 55 - . Payload: S-55. Mass: 84 kg (185 lb). Nation: USA. Agency: NASA. Program: Explorer. Class: Earth. Type: Micrometeoroid satellite. Spacecraft: S-55. Decay Date: 1961-06-30 . Apogee: 172 km (106 mi). Micrometeorite counter satellite (S-55)..
1961 August 17 - . 14:29 GMT - . Launch Site: Cape Canaveral. Launch Complex: Cape Canaveral LC18A. Launch Pad: LC18A. LV Family: Scout. Launch Vehicle: Blue Scout Jr.
HETS Magnetosphere mission - . Nation: USA. Agency: USAF. Class: Earth. Type: Magnetosphere satellite. Apogee: 225,000 km (139,000 mi). 1961 August 25 - . 18:29 GMT - . Launch Site: Wallops Island. Launch Complex: Wallops Island LA3. LV Family: Scout. Launch Vehicle: Scout X-1. FAILURE: Partial Failure.. Failed Stage: 4. Explorer 13 - . Payload: S-55A. Mass: 86 kg (189 lb). Nation: USA. Agency: NASA. Program: Explorer. Class: Earth. Type: Micrometeoroid satellite. Spacecraft: S-55. Decay Date: 1961-08-28 . USAF Sat Cat: 180 . COSPAR: 1961-Chi-1. Apogee: 1,164 km (723 mi). Perigee: 125 km (77 mi). Inclination: 37.70 deg. Period: 97.50 min. Useless orbit; micrometeoroid research. Partial Failure..
1961 October 19 - . 17:38 GMT - . Launch Site: Wallops Island. Launch Complex: Wallops Island LA3. LV Family: Scout. Launch Vehicle: Scout X-1. P-21 Plasma / aeronomy mission - . Nation: USA. Agency: NASA. Apogee: 6,855 km (4,259 mi). 1961 October 29 - . LV Family: Scout. Launch Vehicle: Scout A.
Mercury-Scout announcement - . Nation: USA. Spacecraft: Radio Test Spacecraft, Mercury. An announcement was made that a Mercury-Scout launch would be made to verify the readiness of the world-wide Mercury Tracking network to handle further orbital flights..
1961 November 1 - . 15:32 GMT - . Launch Site: Cape Canaveral. Launch Complex: Cape Canaveral LC18B. Launch Pad: LC18B. LV Family: Scout. Launch Vehicle: Blue Scout II. FAILURE: Failure. Failed Stage: U.
Mercury MS-1 - . Payload: Radio Test Spacecraft. Nation: USA. Agency: USAF. Class: Technology. Type: Tracking network technology satellite. Spacecraft: Radio Test Spacecraft, Mercury. Small satellite was to have verified the readiness of the worldwide Mercury tracking network. An attempt was made to launch Mercury-Scout 1 (MS-1) into orbit with a communications package further to qualify the radar tracking of the Mercury global network prior to manned orbital flight. Shortly after lift-off, the launch vehicle developed erratic motions and attending high aerodynamic loads, and was destroyed by the Range Safety Officer after 43 seconds of flight. No further attempts were planned. The Mercury-Atlas 4 (MA-4) mission and the successful Mercury-Atlas 5 (MA-5), flown on November 29, 1961, disclosed that the network met all requirements. 1961 December 4 - . 04:00 GMT - . Launch Site: Vandenberg. Launch Complex: Vandenberg LC-A. LV Family: Scout. Launch Vehicle: Blue Scout Jr.
Magnetosphere mission - . Nation: USA. Agency: USAF. Apogee: 44,400 km (27,500 mi). 1962 March 1 - . 05:07 GMT - . Launch Site: Wallops Island. Launch Complex: Wallops Island LA3. LV Family: Scout. Launch Vehicle: Scout X-1A. Reentry 1 re-entry vehicle test flight - . Nation: USA. Agency: NASA. Apogee: 214 km (132 mi). 1962 March 29 - . 07:27 GMT - . Launch Site: Wallops Island. Launch Complex: Wallops Island LA3. LV Family: Scout. Launch Vehicle: Scout X-2. P-21A Plasma / aeronomy mission - . Nation: USA. Agency: NASA. Apogee: 6,291 km (3,909 mi). 1962 April 12 - . 16:00 GMT - . Launch Site: Cape Canaveral. Launch Complex: Cape Canaveral LC18B. Launch Pad: LC18B. LV Family: Scout. Launch Vehicle: Blue Scout I. FAILURE: Failure. Reentry Test re-entry vehicle test flight - . Nation: USA. Agency: USAF. Apogee: 30 km (18 mi). x - . Launch Site: , Vandenberg. LV Family: Scout. First Scout launch from Vandenberg - . The first Scout vehicle (#111) was launched from Vandenberg AFB and carried the Navy's Solar Radiation (SOLRAD 4B) payload. However, a third stage failure resulted in payload impact 225-NM downrange..
1962 April 26 - . Launch Site: Vandenberg. Launch Complex: Vandenberg SLC5. LV Family: Scout. Launch Vehicle: Scout X-2. FAILURE: Failure.. Failed Stage: U.
Solrad 4B - . Payload: Grab E. Mass: 91 kg (200 lb). Nation: USA. Agency: USN. Class: Surveillance. Type: SIGINT. Spacecraft: GRAB. Decay Date: 1962-04-26 . The first Scout vehicle (#111) was launched from Vandenberg AFB and carried the Navy's Solar Radiation (SOLRAD 4B) payload (which was actually the last classified Grab ELINT satellite). However, a third stage failure resulted in payload impact 225-NM downrange. Solar radiation monitor. 1962 May 24 - . Launch Site: Vandenberg. Launch Complex: Vandenberg SLC5. LV Family: Scout. Launch Vehicle: Scout X-2M. FAILURE: Failure.. Failed Stage: U.
P 35-1 - . Payload: FTV 3501. Nation: USA. Agency: USAF AFSC. Program: DMSP. Class: Earth. Type: Weather satellite. Spacecraft: Program 35. Decay Date: 1962-05-24 . Military weather satellite to provide targetting information for reconnaisance satellites..
1962 May 31 - . 17:08 GMT - . Launch Site: Vandenberg. Launch Complex: Vandenberg LC-A. LV Family: Scout. Launch Vehicle: Blue Scout Jr SLV-1C. ERCS/279L 1 Communications mission - . Nation: USA. Agency: USAF. Apogee: 830 km (510 mi). 1962 July 24 - . 17:29 GMT - . Launch Site: Vandenberg. Launch Complex: Vandenberg LC-A. LV Family: Scout. Launch Vehicle: Blue Scout Jr SLV-1C. ERCS / 279L 2 Communications mission - . Nation: USA. Agency: USAF. Apogee: 1,000 km (600 mi). 1962 August 23 - . 11:44 GMT - . Launch Site: Vandenberg. Launch Complex: Vandenberg SLC5. LV Family: Scout. Launch Vehicle: Scout X-2M. P 35-2 - . Mass: 91 kg (200 lb). Nation: USA. Agency: USAF. Program: DMSP. Class: Earth. Type: Weather satellite. Spacecraft: Program 35. USAF Sat Cat: 369 . COSPAR: 1962-A-Omicron-1. Apogee: 752 km (467 mi). Perigee: 578 km (359 mi). Inclination: 98.50 deg. Period: 98.10 min. Military weather satellite to provide targetting information for reconnaisance satellites..
1962 August 31 - . Launch Site: Wallops Island. Launch Complex: Wallops Island LA3. LV Family: Scout. Launch Vehicle: Scout X-3A. FAILURE: Late stage 3 ignition.. Failed Stage: 3. Reentry 2 - . Nation: USA. Agency: NASA. Class: Technology. Decay Date: 1962-08-31 . Apogee: 217 km (134 mi). 1962 November 21 - . 18:20 GMT - . Launch Site: Vandenberg. Launch Complex: Vandenberg LC-A. LV Family: Scout. Launch Vehicle: Blue Scout Jr SLV-1C. ERCS / 279L 3 Communications mission - . Nation: USA. Agency: USAF. Apogee: 1,000 km (600 mi). 1962 December 16 - . 14:33 GMT - . Launch Site: Wallops Island. Launch Complex: Wallops Island LA3. LV Family: Scout. Launch Vehicle: Scout X-3. Explorer 16 - . Payload: S-55B. Mass: 100 kg (220 lb). Nation: USA. Agency: NASA. Program: Explorer. Class: Earth. Type: Micrometeoroid satellite. Spacecraft: S-55. USAF Sat Cat: 506 . COSPAR: 1962-B-Chi-1. Apogee: 1,159 km (720 mi). Perigee: 744 km (462 mi). Inclination: 52.00 deg. Period: 104.10 min. Micrometeoroid data. Spacecraft engaged in research and exploration of the upper atmosphere or outer space (US Cat B). .
1962 December 19 - . Launch Site: Vandenberg. Launch Complex: Vandenberg LC-A. LV Family: Scout. Launch Vehicle: Blue Scout Jr SLV-1B(m). Ion Engine Test A Technology mission - . Nation: USA. Agency: USAF. Apogee: 2,000 km (1,200 mi). When the high-voltage power supplies were first turned-on, intermittent high-voltage breakdowns occurred, and the beam power supply became inoperative. Post-flight examination of the power supply indicated the high-voltage breakdowns were probably caused by pressure buildup in the primary propulsion unit due to gas vented from the spacecraft batteries. The primary propulsion unit high voltage section was not adequately vented to keep the pressure low enough. Engine thrusting was not accomplished in this test. 1962 December 19 - . 01:25 GMT - . Launch Site: Vandenberg. Launch Complex: Vandenberg SLC5. LV Family: Scout. Launch Vehicle: Scout X-3. Transit 5A - . Payload: Transit 5A-1. Mass: 61 kg (134 lb). Nation: USA. Agency: USN. Program: Transit. Class: Navigation. Type: Navigation satellite. Spacecraft: Transit. Decay Date: 1986-09-25 . USAF Sat Cat: 509 . COSPAR: 1962-B-Psi-1. Apogee: 347 km (215 mi). Perigee: 336 km (208 mi). Inclination: 90.60 deg. Period: 91.40 min. First operational solar-powered prototype; failed first day. The satellite verified a new technique for deploying the solar panels and for separating from the rocket, but otherwise it was not successful because of trouble with the power system..
1963 February 2 - . 06:56 GMT - . Launch Site: Vandenberg. Launch Complex: Vandenberg LC-A. LV Family: Scout. Launch Vehicle: Blue Scout Jr SLV-1C. ERCS 279L Communications mission - . Nation: USA. Agency: USAF. Apogee: 1,000 km (600 mi). 1963 February 19 - . 16:33 GMT - . Launch Site: Vandenberg. Launch Complex: Vandenberg SLC5. LV Family: Scout. Launch Vehicle: Scout X-3M. P 35-3 - . Mass: 40 kg (88 lb). Nation: USA. Agency: USAF. Program: DMSP. Class: Earth. Type: Weather satellite. Spacecraft: Program 35. Decay Date: 1979-12-26 . USAF Sat Cat: 533 . COSPAR: 1963-005A. Apogee: 810 km (500 mi). Perigee: 488 km (303 mi). Inclination: 100.50 deg. Period: 97.80 min. Military weather satellite to provide targetting information for reconnaisance satellites..
1963 March 14 - . 01:01 GMT - . Launch Site: Vandenberg. Launch Complex: Vandenberg LC-A. LV Family: Scout. Launch Vehicle: Blue Scout Jr SLV-1C. 1963 April 5 - . 03:01 GMT - . Launch Site: Vandenberg. Launch Complex: Vandenberg SLC5. LV Family: Scout. Launch Vehicle: Scout X-3. FAILURE: Failure.. Failed Stage: U. Transit 5A-2 - . Payload: Transit 5A-2. Mass: 84 kg (185 lb). Nation: USA. Agency: USAF. Program: Transit. Class: Navigation. Type: Navigation satellite. Spacecraft: Transit. Decay Date: 1963-04-05 . Replacement for the failed Transit 5A; failed to reach orbit..
1963 April 26 - . Launch Site: Vandenberg. Launch Complex: Vandenberg SLC5. LV Family: Scout. Launch Vehicle: Scout X-2M. FAILURE: Failure.. Failed Stage: U.
P 35-4 - . Payload: OPS 1298. Nation: USA. Agency: USAF. Program: DMSP. Class: Earth. Type: Weather satellite. Spacecraft: Program 35. Decay Date: 1963-04-26 . Military weather satellite to provide targetting information for reconnaisance satellites..
1963 May 17 - . 23:00 GMT - . Launch Site: Vandenberg. Launch Complex: Vandenberg LC-A. LV Family: Scout. Launch Vehicle: Blue Scout Jr SLV-1C. 1963 May 22 - . 04:38 GMT - . Launch Site: Wallops Island. Launch Complex: Wallops Island LA3. LV Family: Scout. Launch Vehicle: Scout X-3. RFD-1 re-entry vehicle test flight - . Nation: USA. Agency: NASA. Apogee: 145 km (90 mi). 1963 June 16 - . 01:49 GMT - . Launch Site: Vandenberg. Launch Complex: Vandenberg SLC5. LV Family: Scout. Launch Vehicle: Scout X-3. Transit 5A-3 - . Payload: Transit 5A-3. Mass: 55 kg (121 lb). Nation: USA. Agency: USN. Program: Transit. Class: Navigation. Type: Navigation satellite. Spacecraft: Transit. Decay Date: 1990-08-03 . USAF Sat Cat: 594 . COSPAR: 1963-022A. Apogee: 360 km (220 mi). Perigee: 350 km (210 mi). Inclination: 89.80 deg. Period: 91.60 min. First operational prototype with a redesigned power supply. A malfunction of the memory occurred during powered flight that kept it from accepting and storing navigation messages, and the oscillator stability was degraded during launch. The satellite could not be used for navigation, but it was the first to achieve gravity-gradient stabilization, and its other subsystems performed well. 1963 June 28 - . 21:19 GMT - . Launch Site: Wallops Island. Launch Complex: Wallops Island LA3. LV Family: Scout. Launch Vehicle: Scout X-4. GRS - . Payload: CRL 1. Mass: 99 kg (218 lb). Nation: USA. Agency: USAF AFC. Class: Earth. Type: Magnetosphere satellite. Spacecraft: GRS. Decay Date: 1983-12-14 . USAF Sat Cat: 612 . COSPAR: 1963-026A. Apogee: 1,306 km (811 mi). Perigee: 413 km (256 mi). Inclination: 49.70 deg. Period: 102.10 min. Geophysical Research Satellite; space gas data. Space craft engaged in investigation of spaceflight techniques and technology (US Cat A). .
1963 July 20 - . 05:44 GMT - . Launch Site: Wallops Island. Launch Complex: Wallops Island LA3. LV Family: Scout. Launch Vehicle: Scout X-3A. FAILURE: Failure..
Reentry 3 re-entry vehicle test flight - . Nation: USA. Agency: NASA. Apogee: 2.00 km (1.20 mi). NASA launched a Scout rocket with a nose cone of experimental heatshield material from Wallops Island, Va. The rocket was intentionally destroyed when it deviated from its course a few seconds after liftoff. The nose cone had been expected to reenter the atmosphere at 27,934 kilometers (18,600 miles) per hour to test the material's thermal performance under heating loads near those of a lunar reentry. 1963 July 30 - . 16:16 GMT - . Launch Site: Cape Canaveral. Launch Complex: Cape Canaveral LC18A. Launch Pad: LC18A. LV Family: Scout. Launch Vehicle: Blue Scout Jr.
OAR 22-1 / AFCRL-1 / 21 Plasma / radio astronomy mission - . Nation: USA. Agency: USAF. Apogee: 11,100 km (6,800 mi). 1963 September 27 - . 11:17 GMT - . Launch Site: Vandenberg. Launch Complex: Vandenberg SLC5. LV Family: Scout. Launch Vehicle: Scout X-2B. FAILURE: Failure.. Failed Stage: U.
P 35-5 - . Payload: OPS 1610. Mass: 40 kg (88 lb). Nation: USA. Agency: USAF. Program: DMSP. Class: Earth. Type: Weather satellite. Spacecraft: Program 35. Decay Date: 1963-09-27 . Military weather satellite to provide targetting information for reconnaisance satellites..
1963 December 17 - . 17:17 GMT - . Launch Site: Vandenberg. Launch Complex: Vandenberg 4300C. Launch Pad: 4300C. LV Family: Scout. Launch Vehicle: Blue Scout Jr SLV-1C. 1963 December 19 - . 18:49 GMT - . Launch Site: Vandenberg. Launch Complex: Vandenberg SLC5. LV Family: Scout. Launch Vehicle: Scout X-4. Explorer 19 - . Payload: ADE A. Mass: 7.00 kg (15.40 lb). Nation: USA. Agency: NASA Langley. Program: Explorer. Class: Earth. Type: Atmosphere satellite. Spacecraft: ADE. Decay Date: 1981-05-10 . USAF Sat Cat: 714 . COSPAR: 1963-053A. Apogee: 2,391 km (1,485 mi). Perigee: 597 km (370 mi). Inclination: 78.60 deg. Period: 115.90 min. In its first NASA use from Vandenberg AFB a Scout rocket (#122) was successfully launched. The 18-pound Explorer 19 atmosphere density satellite was successfully injected into orbit. 12 foot dia. balloon; identical to Explorer 9; atmospheric density studies. Spacecraft engaged in research and exploration of the upper atmosphere or outer space (US Cat B). 1964 March 13 - . 11:40 GMT - . Launch Site: Cape Canaveral. Launch Complex: Cape Canaveral LC18A. Launch Pad: LC18A. LV Family: Scout. Launch Vehicle: Blue Scout Jr. FAILURE: Failure. OAR 22-2 / AFCRL-9 Magnetosphere mission - . Nation: USA. Agency: USAF. Apogee: 600 km (370 mi). 1964 March 27 - . 17:25 GMT - . Launch Site: Wallops Island. Launch Complex: Wallops Island LA3. LV Family: Scout. Launch Vehicle: Scout X-3. Ariel 2 - . Payload: UK 2 (UK-C). Mass: 68 kg (149 lb). Nation: UK. Agency: DSIR. Class: Earth. Type: Magnetosphere satellite. Spacecraft: Ariel. Decay Date: 1967-11-18 . USAF Sat Cat: 771 . COSPAR: 1964-015A. Apogee: 1,349 km (838 mi). Perigee: 287 km (178 mi). Inclination: 51.70 deg. Period: 101.30 min. Spacecraft engaged in research and exploration of the upper atmosphere or outer space (US Cat B). .
1964 June 4 - . 03:50 GMT - . Launch Site: Vandenberg. Launch Complex: Vandenberg SLC5. LV Family: Scout. Launch Vehicle: Scout X-4. Transit 5C-1 - . Payload: Transit 5C / OPS 4412. Mass: 54 kg (119 lb). Nation: USA. Agency: USN. Program: Transit. Class: Navigation. Type: Navigation satellite. Spacecraft: Transit. USAF Sat Cat: 801 . COSPAR: 1964-026A. Apogee: 898 km (557 mi). Perigee: 825 km (512 mi). Inclination: 90.50 deg. Period: 102.20 min. Operational prototype similar to the 5A series but with some redesign to improve performance. Operated successfully until 23 August 1965..
1964 June 25 - . 01:40 GMT - . Launch Site: Vandenberg. Launch Complex: Vandenberg SLC5. LV Family: Scout. Launch Vehicle: Scout X-4. FAILURE: Second stage exploded.. Failed Stage: 2. ESRS - . Payload: CRL 2. Mass: 79 kg (174 lb). Nation: USA. Agency: USAF. Class: Earth. Type: Magnetosphere satellite. Spacecraft: ESRS. Decay Date: 1964-06-25 . Environmental Sciences Research Satellite..
1964 July 20 - . 10:53 GMT - . Launch Site: Wallops Island. Launch Complex: Wallops Island LA3A. LV Family: Scout. Launch Vehicle: Scout X-4. SERT 1 Technology mission - . Nation: USA. Agency: NASA. Apogee: 4,002 km (2,486 mi). Suborbital 30 minute test of NASA SERT ion engine. The early part of the flight was dedicated to attempts to operate the cesium engine. The cesium engine could not be started because of a high-voltage electrical short circuit. The mercury engine was started about 14 minutes into the flight. This engine was successfully operated for 31 minutes with 53 high-voltage recycle vents which were handled by the fault protection system. Each of the recycle events was only a few seconds duration. Major results from the test were the first demonstration of an ion engine in space, demonstration of effective ion beam neutralization, no EMI effects on other spacecraft systems, and effective recovery from electrical breakdowns. Thrust was measured using three independent measuring systems, and there were no major differences between in-space and ground test performance. 1964 August 18 - . 06:05 GMT - . Launch Site: Wallops Island. Launch Complex: Wallops Island LA3. LV Family: Scout. Launch Vehicle: Scout X-4A. Reentry 4A - . Nation: USA. Agency: NASA. Apogee: 183 km (113 mi). Scout launch tested Apollo-type ablator materials at lunar reentry heating levels..
1964 August 25 - . 13:43 GMT - . Launch Site: Vandenberg. Launch Complex: Vandenberg SLC5. LV Family: Scout. Launch Vehicle: Scout X-4. Explorer 20 - . Payload: IE A (S-48 Ionosphere Explorer). Mass: 44 kg (97 lb). Nation: USA. Agency: NASA Greenbelt. Program: Explorer. Class: Earth. Type: Ionosphere satellite. Spacecraft: IE. USAF Sat Cat: 870 . COSPAR: 1964-051A. Apogee: 999 km (620 mi). Perigee: 857 km (532 mi). Inclination: 79.90 deg. Period: 103.60 min. Ionospheric research. Spacecraft engaged in research and exploration of the upper atmosphere or outer space (US Cat B)..
1964 August 29 - . 09:36 GMT - . Launch Site: Vandenberg. Launch Complex: Vandenberg LC-A. LV Family: Scout. Launch Vehicle: Blue Scout Jr SLV-1B(m). Ion Engine Test B Technology mission - . Nation: USA. Agency: USAF. Apogee: 2,000 km (1,200 mi). The first successful ballistic flight test of a cesium ion contact engine was conducted on a Scout booster launched from Vandenberg. Built by Electro-Optical Systems Corporation under an Air Force contract, the engine was the first of its kind to operate in space. The launch was designed to provide about 30 minutes of flight above an altitude of 370 km. At seven minutes into the flight the engine was operated with ion beam extraction. Full beam current of 94 mA was achieved about 10 minutes later. During the course of engine operation, an electric field strength meter was used to infer payload floating potential relative to space. Spacecraft potential was about 1000 V negative during most of the engine operation with the filament neutralizer. The absolute value of payload potential was about ten times higher than anticipated, and it was suspected that there was inadequate neutralization of the ion beam. The contact ion engine operated for 19 minutes until spacecraft reentry into the atmosphere. In addition to withstanding the environmental rigors of space flight, the ion propulsion system demonstrated electromagnetic compatibility with other spacecraft subsystems and the ability to regulate and control a desired thrust level. 1964 October 9 - . 04:04 GMT - . Launch Site: Wallops Island. Launch Complex: Wallops Island LA3A. LV Family: Scout. Launch Vehicle: Scout X-3C. RFD-2 re-entry vehicle test flight - . Nation: USA. Agency: NASA. Apogee: 132 km (82 mi). 1964 October 10 - . 03:00 GMT - . Launch Site: Vandenberg. Launch Complex: Vandenberg SLC5. LV Family: Scout. Launch Vehicle: Scout X-4. Explorer 22 - . Payload: Beacon Explorer B. Mass: 52 kg (114 lb). Nation: USA. Agency: NASA Greenbelt. Program: Explorer. Class: Earth. Type: Ionosphere satellite. Spacecraft: Beacon. USAF Sat Cat: 899 . COSPAR: 1964-064A. Apogee: 1,053 km (654 mi). Perigee: 872 km (541 mi). Inclination: 79.70 deg. Period: 104.30 min. Ionospheric and geodetic data. Spacecraft engaged in research and exploration of the upper atmosphere or outer space..
1964 November 6 - . 12:02 GMT - . Launch Site: Wallops Island. Launch Complex: Wallops Island LA3. LV Family: Scout. Launch Vehicle: Scout X-4. Explorer 23 - . Payload: S-55C. Mass: 134 kg (295 lb). Nation: USA. Agency: NASA Langley. Program: Explorer. Class: Earth. Type: Micrometeoroid satellite. Spacecraft: S-55. Decay Date: 1983-06-29 . USAF Sat Cat: 924 . COSPAR: 1964-074A. Apogee: 980 km (600 mi). Perigee: 463 km (287 mi). Inclination: 51.90 deg. Period: 99.20 min. Micrometeoroid data. Spacecraft engaged in research and exploration of the upper atmosphere or outer space (US Cat B). .
1964 November 21 - . 17:09 GMT - . Launch Site: Vandenberg. Launch Complex: Vandenberg SLC5. LV Family: Scout. Launch Vehicle: Scout X-4. Explorer 24 - . Payload: ADE B. Mass: 9.00 kg (19.80 lb). Nation: USA. Agency: NASA Langley. Program: Explorer. Class: Earth. Type: Atmosphere satellite. Spacecraft: ADE. Decay Date: 1968-10-18 . USAF Sat Cat: 931 . COSPAR: 1964-076A. Apogee: 2,498 km (1,552 mi). Perigee: 530 km (320 mi). Inclination: 81.40 deg. Period: 116.30 min. 12 foot dia. balloon; atmospheric density studies. Spacecraft engaged in research and exploration of the upper atmosphere or outer space (US Cat B). .
Explorer 25 - . Payload: Injun 4. Mass: 40 kg (88 lb). Nation: USA. Agency: NASA Langley. Program: Explorer. Class: Earth. Type: Magnetosphere satellite. Spacecraft: Injun. USAF Sat Cat: 932 . COSPAR: 1964-076B. Apogee: 2,319 km (1,440 mi). Perigee: 526 km (326 mi). Inclination: 81.30 deg. Period: 114.30 min. Radiation data. Spacecraft engaged in research and exploration of the upper atmosphere or outer space (US Cat B). .
1964 December 15 - . 20:20 GMT - . Launch Site: Wallops Island. Launch Complex: Wallops Island LA3A. LV Family: Scout. Launch Vehicle: Scout X-4. San Marco 1 - . Mass: 254 kg (559 lb). Nation: Italy. Agency: CRS. Class: Earth. Type: Atmosphere satellite. Spacecraft: San Marco satellite. Decay Date: 1965-09-11 . USAF Sat Cat: 957 . COSPAR: 1964-084A. Apogee: 842 km (523 mi). Perigee: 200 km (120 mi). Inclination: 37.80 deg. Period: 95.10 min. Atmospheric density studies. Spacecraft engaged in research and exploration of the upper atmosphere or outer space (US Cat B). .
1964 December 22 - . 04:00 GMT - . Launch Site: Vandenberg. Launch Complex: Vandenberg LC-A. LV Family: Scout. Launch Vehicle: Blue Scout Jr SLV-1B(m). FAILURE: Third stage cut off early.. Failed Stage: 3. Ion Engine Test C Technology mission - . Nation: USA. Agency: USAF. Apogee: 500 km (310 mi). In this test, an additional wire neutralizer was incorporated and was immersed in the ion beam to provide a higher probability of adequate neutralization. The contact ion engine only achieved about 20% of full-thrust before reentry into the atmosphere. The short test time was due to a very short burn of the Scout vehicle's third stage. The high voltage was applied to the engine 7 minutes into the flight when the altitude was 490 km. Engine operation ended after 4 minutes when the altitude was only 80 km. 1965 January 28 - . 12:51 GMT - . Launch Site: Cape Canaveral. Launch Complex: Cape Canaveral LC18A. Launch Pad: LC18A. LV Family: Scout. Launch Vehicle: Blue Scout Jr. FAILURE: Failure. OAR 22-3 / AFCRL-309 Magnetosphere mission - . Nation: USA. Agency: USAF. Apogee: 200 km (120 mi). 1965 March 30 - . Launch Site: Cape Canaveral. Launch Complex: Cape Canaveral LC18A. Launch Pad: LC18A. LV Family: Scout. Launch Vehicle: Blue Scout Jr.
OAR 22-4 / AFCRL-35 Magnetosphere mission - . Nation: USA. Agency: USAF. Apogee: 12,067 km (7,498 mi). 1965 April 9 - . 18:10 GMT - . Launch Site: Cape Canaveral. Launch Complex: Cape Canaveral LC18A. Launch Pad: LC18A. LV Family: Scout. Launch Vehicle: Blue Scout Jr.
OAR 22-9 / AFWL-14 Magnetosphere mission - . Nation: USA. Agency: USAF. Apogee: 25,422 km (15,796 mi). 1965 April 29 - . 14:17 GMT - . Launch Site: Wallops Island. Launch Complex: Wallops Island LA3A. LV Family: Scout. Launch Vehicle: Scout X-4. Explorer 27 - . Payload: Beacon Explorer C. Mass: 60 kg (132 lb). Nation: USA. Agency: NASA Greenbelt. Program: Explorer. Class: Earth. Type: Ionosphere satellite. Spacecraft: Beacon. USAF Sat Cat: 1328 . COSPAR: 1965-032A. Apogee: 1,309 km (813 mi). Perigee: 932 km (579 mi). Inclination: 41.20 deg. Period: 107.70 min. Battery failed in 1968; ionospheric research and geodetic data. Spacecraft engaged in research and exploration of the upper atmosphere or outer space..
1965 May 12 - . 16:00 GMT - . Launch Site: Cape Canaveral. Launch Complex: Cape Canaveral LC18A. Launch Pad: LC18A. LV Family: Scout. Launch Vehicle: Blue Scout Jr.
OAR 22-8 / AFCRL-335 Magnetosphere mission - . Nation: USA. Agency: USAF. Apogee: 13,586 km (8,441 mi). 1965 June 9 - . Launch Site: Cape Canaveral. Launch Complex: Cape Canaveral LC18A. Launch Pad: LC18A. LV Family: Scout. Launch Vehicle: Blue Scout Jr.
OAR 22-5 / AFWL-304 Magnetosphere mission - . Nation: USA. Agency: USAF. Apogee: 17,533 km (10,894 mi). 1965 August 10 - . 17:54 GMT - . Launch Site: Wallops Island. Launch Complex: Wallops Island LA3A. LV Family: Scout. Launch Vehicle: Scout B.
SECOR 5 (EGRS 5) - . Payload: SEV / FW4S. Mass: 24 kg (52 lb). Nation: USA. Agency: NASA Langley. Class: Earth. Type: Geodetic satellite. Spacecraft: SECOR. USAF Sat Cat: 1506 . COSPAR: 1965-063A. Apogee: 2,419 km (1,503 mi). Perigee: 1,134 km (704 mi). Inclination: 69.20 deg. Period: 122.20 min. Spacecraft engaged in research and exploration of the upper atmosphere or outer space (US Cat B). .
Secor 5 - . Payload: Secor 5. Nation: USA. Agency: US Army. Spacecraft: SECOR. USAF Sat Cat: 1502 . COSPAR: 1965-063B. Apogee: 2,424 km (1,506 mi). Perigee: 1,136 km (705 mi). Inclination: 69.20 deg. Period: 122.22 min. 1965 November 19 - . 04:48 GMT - . Launch Site: Wallops Island. Launch Complex: Wallops Island LA3A. LV Family: Scout. Launch Vehicle: Scout X-4. Explorer 30 - . Payload: Solar Explorer A. Mass: 57 kg (125 lb). Nation: USA. Agency: NRL. Program: Explorer. Class: Astronomy. Type: Solar satellite. Spacecraft: IQSY. USAF Sat Cat: 1738 . COSPAR: 1965-093A. Apogee: 856 km (531 mi). Perigee: 671 km (416 mi). Inclination: 59.70 deg. Period: 100.10 min. Solar radiation data. Spacecraft engaged in research and exploration of the upper atmosphere or outer space (US Cat B). .
1965 December 6 - . 21:05 GMT - . Launch Site: Vandenberg. Launch Complex: Vandenberg SLC5. LV Family: Scout. Launch Vehicle: Scout X-4. FRANCE 1 - . Payload: FR 1. Mass: 60 kg (132 lb). Nation: France. Agency: CNES. Class: Earth. Type: Ionosphere satellite. Spacecraft: FRANCE satellite. USAF Sat Cat: 1814 . COSPAR: 1965-101A. Apogee: 707 km (439 mi). Perigee: 696 km (432 mi). Inclination: 75.90 deg. Period: 98.80 min. VLF wave propagation studies. Investigation of the properties of the ionized layers of the atmosphere by observation of the propagation of the properties of very low frequency waves in the ionosphere. First registered by the United States in A/AC.105/INF.125. Orbit given there was 99 .9 min, 749 x 753 km x 75.9 deg, with note: France provided the payload for 1965-101A. 1965 December 22 - . 04:33 GMT - . Launch Site: Vandenberg. Launch Complex: Vandenberg SLC5. LV Family: Scout. Launch Vehicle: Scout A. Transit O-6 - . Mass: 60 kg (132 lb). Nation: USA. Agency: USN. Program: Transit. Class: Navigation. Type: Navigation satellite. Spacecraft: Transit. USAF Sat Cat: 1864 . COSPAR: 1965-109A. Apogee: 1,059 km (658 mi). Perigee: 891 km (553 mi). Inclination: 89.10 deg. Period: 104.60 min. Spacecraft built by Naval Avionics Facility, but refurbished by APL. Operated for 7 to 11 months, but then failed due to poor workmanship of NAFI components..
1966 January 28 - . 17:06 GMT - . Launch Site: Vandenberg. Launch Complex: Vandenberg SLC5. LV Family: Scout. Launch Vehicle: Scout A. Transit O-7 - . Mass: 50 kg (110 lb). Nation: USA. Agency: USN. Program: Transit. Class: Navigation. Type: Navigation satellite. Spacecraft: Transit. USAF Sat Cat: 1952 . COSPAR: 1966-005A. Apogee: 1,180 km (730 mi). Perigee: 850 km (520 mi). Inclination: 90.00 deg. Period: 105.40 min. Naval Avionics Facility-assembled production spacecraft. Failed after a few weeks operation..
1966 February 10 - . 00:55 GMT - . Launch Site: Wallops Island. Launch Complex: Wallops Island LA3A. LV Family: Scout. Launch Vehicle: Scout X-4A. Reentry 4B Re-entry vehicle test - . Nation: USA. Agency: NASA. Apogee: 175 km (108 mi). 1966 March 26 - . 03:31 GMT - . Launch Site: Vandenberg. Launch Complex: Vandenberg SLC5. LV Family: Scout. Launch Vehicle: Scout A. Transit O-8 - . Mass: 50 kg (110 lb). Nation: USA. Agency: USN. Program: Transit. Class: Navigation. Type: Navigation satellite. Spacecraft: Transit. USAF Sat Cat: 2119 . COSPAR: 1966-024A. Apogee: 1,099 km (682 mi). Perigee: 879 km (546 mi). Inclination: 89.70 deg. Period: 104.90 min. Spacecraft built by Naval Avionics Facility, but refurbished by APL. Operated for 7 to 11 months, but then failed due to poor workmanship of NAFI components..
1966 April 22 - . 09:45 GMT - . Launch Site: Vandenberg. Launch Complex: Vandenberg SLC5. LV Family: Scout. Launch Vehicle: Scout B.
OV3-01 - . Mass: 69 kg (152 lb). Nation: USA. Agency: USAF OAR. Class: Earth. Type: Magnetosphere satellite. Spacecraft: OV3. USAF Sat Cat: 2150 . COSPAR: 1966-034A. Apogee: 3,585 km (2,227 mi). Perigee: 341 km (211 mi). Inclination: 82.40 deg. Period: 126.40 min. Radiation data. Space craft engaged in investigation of spaceflight techniques and technology (US Cat A)..
1966 May 19 - . 02:27 GMT - . Launch Site: Vandenberg. Launch Complex: Vandenberg SLC5. LV Family: Scout. Launch Vehicle: Scout A. Transit O-9 - . Mass: 50 kg (110 lb). Nation: USA. Agency: USN. Program: Transit. Class: Navigation. Type: Navigation satellite. Spacecraft: Transit. USAF Sat Cat: 2176 . COSPAR: 1966-041A. Apogee: 951 km (590 mi). Perigee: 833 km (517 mi). Inclination: 90.10 deg. Period: 102.80 min. Spacecraft built by Naval Avionics Facility, but refurbished by APL. Operated for 7 to 11 months, but then failed due to poor workmanship of NAFI components..
1966 June 10 - . 04:15 GMT - . Launch Site: Wallops Island. Launch Complex: Wallops Island LA3A. LV Family: Scout. 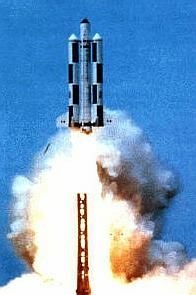 Launch Vehicle: Scout B.
OV3-04 - . Mass: 79 kg (174 lb). Nation: USA. Agency: USAF OAR. Class: Earth. Type: Magnetosphere satellite. Spacecraft: OV3. USAF Sat Cat: 2201 . COSPAR: 1966-052A. Apogee: 4,704 km (2,922 mi). Perigee: 643 km (399 mi). Inclination: 40.90 deg. Period: 142.90 min. Radiation measurements. Space craft engaged in investigation of spaceflight techniques and technology (US Cat A). .
1966 August 4 - . 10:45 GMT - . Launch Site: Vandenberg. Launch Complex: Vandenberg SLC5. LV Family: Scout. Launch Vehicle: Scout B.
OV3-03 - . Mass: 75 kg (165 lb). Nation: USA. Agency: USAF OAR. Class: Earth. Type: Magnetosphere satellite. Spacecraft: OV3. USAF Sat Cat: 2389 . COSPAR: 1966-070A. Apogee: 3,141 km (1,951 mi). Perigee: 349 km (216 mi). Inclination: 81.40 deg. Period: 121.40 min. Radiation measurements. Space craft engaged in investigation of spaceflight techniques and technology (US Cat A). .
1966 August 18 - . 02:25 GMT - . Launch Site: Vandenberg. Launch Complex: Vandenberg SLC5. LV Family: Scout. Launch Vehicle: Scout A. Transit O-10 - . Mass: 58 kg (127 lb). Nation: USA. Agency: USN. Program: Transit. Class: Navigation. Type: Navigation satellite. Spacecraft: Transit. USAF Sat Cat: 2401 . COSPAR: 1966-076A. Apogee: 1,089 km (676 mi). Perigee: 1,038 km (644 mi). Inclination: 88.90 deg. Period: 106.50 min. Spacecraft built by Naval Avionics Facility, but refurbished by APL. Only partially operational due to a decrease in the number of solar cells available for charging the batteries after thermal working of the solar cell interconnections in day/night cycles. 1966 October 28 - . 11:56 GMT - . Launch Site: Vandenberg. Launch Complex: Vandenberg SLC5. LV Family: Scout. Launch Vehicle: Scout B.
OV3-02 - . Mass: 82 kg (180 lb). Nation: USA. Agency: USAF OAR. Class: Earth. Type: Magnetosphere satellite. Spacecraft: OV3. Decay Date: 1971-09-29 . USAF Sat Cat: 2517 . COSPAR: 1966-097A. Apogee: 1,599 km (993 mi). Perigee: 319 km (198 mi). Inclination: 81.90 deg. Period: 104.20 min. Radiation data. Space craft engaged in investigation of spaceflight techniques and technology (US Cat A). .
1967 January 31 - . 12:45 GMT - . Launch Site: Vandenberg. Launch Complex: Vandenberg SLC5. LV Family: Scout. Launch Vehicle: Scout B. FAILURE: Failure.. Failed Stage: U.
OV3-05 - . Payload: OV3-05. Mass: 80 kg (176 lb). Nation: USA. Agency: USAF AFSC. Class: Earth. Type: Magnetosphere satellite. Spacecraft: OV3. Decay Date: 1967-01-21 . 1967 April 14 - . 03:25 GMT - . Launch Site: Vandenberg. Launch Complex: Vandenberg SLC5. LV Family: Scout. Launch Vehicle: Scout A. Transit O-12 - . Mass: 60 kg (132 lb). Nation: USA. Agency: USN. Program: Transit. Class: Navigation. Type: Navigation satellite. Spacecraft: Transit. USAF Sat Cat: 2754 . COSPAR: 1967-034A. Apogee: 1,064 km (661 mi). Perigee: 1,037 km (644 mi). Inclination: 90.10 deg. Period: 106.20 min. First APL-built Transit Operational satellite. Operational life of this and subsequent Transits was over 14 years..
1967 April 26 - . 10:06 GMT - . Launch Site: San Marco. LV Family: Scout. Launch Vehicle: Scout B.
San Marco 2 - . Payload: San Marco B. Mass: 129 kg (284 lb). Nation: Italy. Agency: CRS. Class: Earth. Type: Atmosphere satellite. Spacecraft: San Marco satellite. Decay Date: 1967-10-14 . USAF Sat Cat: 2761 . COSPAR: 1967-038A. Apogee: 741 km (460 mi). Perigee: 219 km (136 mi). Inclination: 2.90 deg. Period: 94.20 min. Atmospheric density data. Scientific satellite launched from a mobile range off Formosa Bay (Kenya). .
1967 May 5 - . 16:00 GMT - . Launch Site: Vandenberg. Launch Complex: Vandenberg SLC5. LV Family: Scout. Launch Vehicle: Scout A.
Ariel 3 - . Payload: UK 3 (UK-E). Mass: 90 kg (198 lb). Nation: UK. Agency: SRC. Class: Technology. Type: Navigation technology satellite. Spacecraft: Ariel. Decay Date: 1970-12-14 . USAF Sat Cat: 2773 . COSPAR: 1967-042A. Apogee: 604 km (375 mi). Perigee: 499 km (310 mi). Inclination: 80.60 deg. Period: 95.60 min. Spacecraft engaged in research and exploration of the upper atmosphere or outer space (US Cat B). .
1967 May 18 - . 09:05 GMT - . Launch Site: Vandenberg. Launch Complex: Vandenberg SLC5. LV Family: Scout. Launch Vehicle: Scout A. Transit O-13 - . Mass: 60 kg (132 lb). Nation: USA. Agency: USN. Program: Transit. Class: Navigation. Type: Navigation satellite. Spacecraft: Transit. USAF Sat Cat: 2807 . COSPAR: 1967-048A. Apogee: 1,088 km (676 mi). Perigee: 1,059 km (658 mi). Inclination: 89.60 deg. Period: 106.70 min. Operational life over 20 years..
1967 May 30 - . 02:06 GMT - . Launch Site: Vandenberg. Launch Complex: Vandenberg SLC5. LV Family: Scout. Launch Vehicle: Scout B. FAILURE: Third stage failure.. Failed Stage: 3. ESRO 2A - . Payload: Iris 1. Mass: 74 kg (163 lb). Nation: Europe. Agency: ESRO. Class: Technology. Type: Navigation technology satellite. Spacecraft: ESRO. Decay Date: 1967-05-29 . 1967 September 25 - . 08:25 GMT - . Launch Site: Vandenberg. Launch Complex: Vandenberg SLC5. LV Family: Scout. Launch Vehicle: Scout A. Transit O-14 - . Mass: 60 kg (132 lb). Nation: USA. Agency: USN. Program: Transit. Class: Navigation. Type: Navigation satellite. Spacecraft: Transit. USAF Sat Cat: 2965 . COSPAR: 1967-092A. Apogee: 1,099 km (682 mi). Perigee: 1,030 km (640 mi). Inclination: 89.20 deg. Period: 106.50 min. 1967 October 19 - . 17:33 GMT - . Launch Site: Wallops Island. Launch Complex: Wallops Island LA3A. LV Family: Scout. Launch Vehicle: Scout B.
RAM C-1 Re-entry vehicle test - . Nation: USA. Agency: NASA. Apogee: 217 km (134 mi). 1967 December 5 - . 01:03 GMT - . Launch Site: Vandenberg. Launch Complex: Vandenberg SLC5. LV Family: Scout. Launch Vehicle: Scout B.
OV3-06 - . Payload: ATCOS 2. Mass: 95 kg (209 lb). Nation: USA. Agency: USAF OAR. Class: Earth. Type: Magnetosphere satellite. Spacecraft: OV3. Decay Date: 1969-03-09 . USAF Sat Cat: 3057 . COSPAR: 1967-120A. Apogee: 443 km (275 mi). Perigee: 409 km (254 mi). Inclination: 90.00 deg. Period: 93.00 min. Ionospheric studies. Space craft engaged in investigation of spaceflight techniques and technology (US Cat A). .
1968 March 2 - . 03:55 GMT - . Launch Site: Vandenberg. Launch Complex: Vandenberg SLC5. LV Family: Scout. Launch Vehicle: Scout A. Transit O-18 - . Mass: 60 kg (132 lb). Nation: USA. Agency: USN. Program: Transit. Class: Navigation. Type: Navigation satellite. Spacecraft: Transit. USAF Sat Cat: 3133 . COSPAR: 1968-012A. Apogee: 1,130 km (700 mi). Perigee: 1,014 km (630 mi). Inclination: 90.00 deg. Period: 106.70 min. First RCA-built Transit..
1968 March 5 - . 18:28 GMT - . Launch Site: Wallops Island. Launch Complex: Wallops Island LA3A. LV Family: Scout. Launch Vehicle: Scout B. FAILURE: Partial Failure.. Failed Stage: 4. Explorer 37 - . Payload: Solar Explorer B. Mass: 198 kg (436 lb). Nation: USA. Agency: NRL. Program: Explorer. Class: Astronomy. Type: Solar satellite. Spacecraft: Solrad. Decay Date: 1990-11-16 . USAF Sat Cat: 3141 . COSPAR: 1968-017A. Apogee: 433 km (269 mi). Perigee: 353 km (219 mi). Inclination: 59.30 deg. Period: 92.40 min. Solar Explorer B; radiation data; off-nominal orbit..
1968 April 27 - . 05:19 GMT - . Launch Site: Wallops Island. Launch Complex: Wallops Island LA3A. LV Family: Scout. Launch Vehicle: Scout X-5C. Reentry 5 re-entry vehicle test flight - . Nation: USA. Agency: NASA. Apogee: 175 km (108 mi). 1968 May 17 - . 02:06 GMT - . Launch Site: Vandenberg. Launch Complex: Vandenberg SLC5. LV Family: Scout. Launch Vehicle: Scout B.
ESRO 2B - . Payload: IRIS. Mass: 75 kg (165 lb). Nation: Europe. Agency: ESRO. Class: Technology. Type: Navigation technology satellite. Spacecraft: ESRO. Decay Date: 1971-05-08 . USAF Sat Cat: 3233 . COSPAR: 1968-041A. Apogee: 1,085 km (674 mi). Perigee: 334 km (207 mi). Inclination: 97.20 deg. Period: 99.00 min. 1968 August 8 - . 20:12 GMT - . Launch Site: Vandenberg. Launch Complex: Vandenberg SLC5. LV Family: Scout. Launch Vehicle: Scout B.
Explorer 39 - . Payload: ADE C. Mass: 9.00 kg (19.80 lb). Nation: USA. Agency: NASA Langley. Program: Explorer. Class: Earth. Type: Atmosphere satellite. Spacecraft: ADE. Decay Date: 1981-06-22 . USAF Sat Cat: 3337 . COSPAR: 1968-066A. Apogee: 2,538 km (1,577 mi). Perigee: 670 km (410 mi). Inclination: 80.70 deg. Period: 118.30 min. Air Density Explorer; atmospheric density and temperature data. Spacecraft engaged in research and exploration of the upper atmosphere or outer space (US Cat B). .
Explorer 40 - . Payload: Injun E. Mass: 70 kg (154 lb). Nation: USA. Agency: NASA Langley. Program: Explorer. Class: Earth. Type: Magnetosphere satellite. Spacecraft: Injun. USAF Sat Cat: 3338 . COSPAR: 1968-066B. Apogee: 2,489 km (1,546 mi). Perigee: 679 km (421 mi). Inclination: 80.70 deg. Period: 117.80 min. Injun Explorer; radiation data. Spacecraft engaged in research and exploration of the upper atmosphere or outer space (US Cat B). .
1968 August 22 - . 15:16 GMT - . Launch Site: Wallops Island. Launch Complex: Wallops Island LA3A. LV Family: Scout. Launch Vehicle: Scout B.
RAM C-2 Re-entry vehicle test - . Nation: USA. Agency: NASA. Apogee: 227 km (141 mi). 1968 October 3 - . 20:49 GMT - . Launch Site: Vandenberg. Launch Complex: Vandenberg SLC5. LV Family: Scout. Launch Vehicle: Scout B.
ESRO 1A - . Payload: Aurorae. Mass: 81 kg (178 lb). Nation: Europe. Agency: ESRO. Class: Technology. Type: Navigation technology satellite. Spacecraft: ESRO. Decay Date: 1970-06-26 . USAF Sat Cat: 3459 . COSPAR: 1968-084A. Apogee: 1,538 km (955 mi). Perigee: 258 km (160 mi). Inclination: 93.80 deg. Period: 103.00 min. Aurora, polar ionosphere investigations. .
1969 October 1 - . 22:29 GMT - . Launch Site: Vandenberg. Launch Complex: Vandenberg SLC5. LV Family: Scout. Launch Vehicle: Scout B. FAILURE: Partial Failure.. Failed Stage: 4. ESRO 1B - . Payload: Boreas. Mass: 80 kg (176 lb). Nation: Europe. Agency: ESRO. Class: Technology. Type: Navigation technology satellite. Spacecraft: ESRO. Decay Date: 1969-11-23 . USAF Sat Cat: 4114 . COSPAR: 1969-083A. Apogee: 378 km (234 mi). Perigee: 298 km (185 mi). Inclination: 85.00 deg. Period: 91.30 min. Ionospheric and auroral investigations; lower than planned orbit. Fourth satellite of ESRO. Also registered by the United States in A/AC.105/INF.220 as United States space object 1969-83A, with category B and orbital parameters 90.6 min, 280 x 339 km x 85.1 deg. 1969 November 8 - . 01:52 GMT - . Launch Site: Vandenberg. Launch Complex: Vandenberg SLC5. LV Family: Scout. Launch Vehicle: Scout B.
Azur - . Payload: GRS A. Mass: 71 kg (156 lb). Nation: Germany. Agency: DFVLR. Class: Earth. Type: Magnetosphere satellite. Spacecraft: AZUR. USAF Sat Cat: 4221 . COSPAR: 1969-097A. Apogee: 2,127 km (1,321 mi). Perigee: 373 km (231 mi). Inclination: 102.70 deg. Period: 110.50 min. German Research Satellite A; examined Van Allen belts, solar particles, aurora. Spacecraft engaged in research and exploration of the upper atmosphere or outer space (US Cat B). .
1970 January 10 - . LV Family: Scout. NASA to contract for services of a Scout (SLV-1) launch team - . A NASA/Defense Department agreement provided that NASA would contract for the services of a Scout (SLV-1) launch team beginning on 1 July 1970. Under Air Force supervision, the team would launch Scout vehicles from Vandenberg AFB for both NASA and the Defense Department. 1970 August 27 - . 13:23 GMT - . Launch Site: Vandenberg. Launch Complex: Vandenberg SLC5. LV Family: Scout. Launch Vehicle: Scout A. Transit O-19 - . Mass: 18 kg (39 lb). Nation: USA. Agency: USN. Program: Transit. Class: Navigation. Type: Navigation satellite. Spacecraft: Transit. USAF Sat Cat: 4507 . COSPAR: 1970-067A. Apogee: 1,201 km (746 mi). Perigee: 946 km (587 mi). Inclination: 90.00 deg. Period: 106.70 min. The last Scout booster to be launched by an all-military crew was fired from Vandenberg AFB. Future Scout operations would be conducted by contractor launch teams under Air Force technical management. .
1970 September 30 - . 20:06 GMT - . Launch Site: Wallops Island. Launch Complex: Wallops Island LA3A. LV Family: Scout. Launch Vehicle: Scout B.
RAM C-3 re-entry vehicle test flight - . Nation: USA. Agency: NASA. Apogee: 269 km (167 mi). 1970 November 9 - . 06:00 GMT - . Launch Site: Wallops Island. Launch Complex: Wallops Island LA3A. LV Family: Scout. Launch Vehicle: Scout B.
OFO 1 - . Payload: OFO 1 / RM 1. Mass: 133 kg (293 lb). Nation: USA. Agency: NASA Ames. Class: Biology. Type: Biology satellite. Spacecraft: OFO. Decay Date: 1971-05-09 . USAF Sat Cat: 4690 . COSPAR: 1970-094A. Apogee: 518 km (321 mi). Perigee: 304 km (188 mi). Inclination: 37.40 deg. Period: 92.60 min. RM-1; RMS - . Payload: RM/FW4S. Mass: 46 kg (101 lb). Nation: USA. Agency: NASA Houston. Class: Earth. Type: Micrometeoroid satellite. Spacecraft: RM. Decay Date: 1971-02-07 . USAF Sat Cat: 4692 . COSPAR: 1970-094B. Apogee: 526 km (326 mi). Perigee: 303 km (188 mi). Inclination: 37.40 deg. Period: 92.70 min. Radiation Meteoroid. Spacecraft engaged in research and exploration of the upper atmosphere or outer space (US Cat B). .
1970 November 25 - . 03:17 GMT - . Launch Site: Wallops Island. LV Family: Scout. Launch Vehicle: Blue Scout Jr SLV-1C. Ultraviolet Telescope Ultraviolet astronomy mission - . Nation: USA. Agency: USN. Apogee: 1,480 km (910 mi). 1970 December 12 - . 10:53 GMT - . Launch Site: San Marco. LV Family: Scout. Launch Vehicle: Scout B.
Explorer 42 - . Payload: SAS A. Mass: 143 kg (315 lb). Nation: Italy. Agency: NASA Greenbelt. Program: Explorer. Class: Astronomy. Type: Solar satellite. Spacecraft: SAS. Decay Date: 1979-04-05 . USAF Sat Cat: 4797 . COSPAR: 1970-107A. Apogee: 570 km (350 mi). Perigee: 521 km (323 mi). Inclination: 3.00 deg. Period: 95.50 min. Spacecraft engaged in research and exploration of the upper atmosphere or outer space (US Cat B). .
1971 April 24 - . 07:32 GMT - . Launch Site: San Marco. LV Family: Scout. Launch Vehicle: Scout B.
San Marco 3 - . Payload: San Marco C. Mass: 164 kg (361 lb). Nation: Italy. Agency: CRS. Class: Earth. Type: Atmosphere satellite. Spacecraft: San Marco satellite. Decay Date: 1971-11-29 . USAF Sat Cat: 5176 . COSPAR: 1971-036A. Apogee: 707 km (439 mi). Perigee: 222 km (137 mi). Inclination: 3.20 deg. Period: 93.80 min. Atmospheric research. Spacecraft engaged in research and exploration of the upper atmosphere or outer space (US Cat B). .
1971 June 20 - . 19:31 GMT - . Launch Site: Wallops Island. Launch Complex: Wallops Island LA3A. LV Family: Scout. Launch Vehicle: Scout B.
PAET re-entry vehicle test flight - . Nation: USA. Agency: NASA. Apogee: 377 km (234 mi). 1971 July 8 - . 22:58 GMT - . Launch Site: Wallops Island. Launch Complex: Wallops Island LA3A. LV Family: Scout. Launch Vehicle: Scout B.
Explorer 44 - . Payload: Solar Explorer C. Mass: 118 kg (260 lb). Nation: USA. Agency: NRL. Program: Explorer. Class: Astronomy. Type: Solar satellite. Spacecraft: Solrad. Decay Date: 1979-12-15 . USAF Sat Cat: 5317 . COSPAR: 1971-058A. Apogee: 632 km (392 mi). Perigee: 433 km (269 mi). Inclination: 51.10 deg. Period: 95.20 min. Solar radition data. Spacecraft engaged in research and exploration of the upper atmosphere or outer space (US Cat B). .
1971 August 16 - . 18:39 GMT - . Launch Site: Wallops Island. Launch Complex: Wallops Island LA3A. LV Family: Scout. Launch Vehicle: Scout B-1. Eole 1 - . Mass: 84 kg (185 lb). Nation: France. Agency: CNES. Class: Earth. Type: Weather satellite. Spacecraft: Eole satellite. USAF Sat Cat: 5435 . COSPAR: 1971-071A. Apogee: 836 km (519 mi). Perigee: 651 km (404 mi). Inclination: 50.20 deg. Period: 99.70 min. Experimental weather satellite; received meteorological data from balloon network. Spacecraft engaged in research and exploration of the upper atmosphere or outer space (US Cat B). .
1971 September 20 - . 23:31 GMT - . Launch Site: Wallops Island. Launch Complex: Wallops Island LA3A. LV Family: Scout. Launch Vehicle: Scout B.
BIC Plasma / barium release mission - . Nation: USA. Agency: NASA. Apogee: 31,479 km (19,560 mi). 1971 November 15 - . 05:52 GMT - . Launch Site: San Marco. LV Family: Scout. Launch Vehicle: Scout B.
Explorer 45 - . Payload: SSS A. Mass: 52 kg (114 lb). Nation: USA. Agency: NASA Greenbelt. Program: Explorer. Class: Earth. Type: Magnetosphere satellite. Spacecraft: SSS. Decay Date: 1992-01-10 . USAF Sat Cat: 5598 . COSPAR: 1971-096A. Apogee: 18,149 km (11,277 mi). Perigee: 272 km (169 mi). Inclination: 3.20 deg. Period: 322.80 min. Studies magnetosphere, energetic particles. Spacecraft engaged in research and exploration of the upper atmosphere or outer space (US Cat B). .
1971 December 11 - . 20:47 GMT - . Launch Site: Vandenberg. Launch Complex: Vandenberg SLC5. LV Family: Scout. Launch Vehicle: Scout B-1. Ariel 4 - . Payload: UK 4. Mass: 100 kg (220 lb). Nation: UK. Agency: SRC. Class: Earth. Type: Magnetosphere satellite. Spacecraft: Ariel. Decay Date: 1978-12-12 . USAF Sat Cat: 5675 . COSPAR: 1971-109A. Apogee: 592 km (367 mi). Perigee: 476 km (295 mi). Inclination: 82.00 deg. Period: 95.30 min. Ionospheric studies. Spacecraft engaged in research and exploration of the upper atmosphere or outer space (US Cat B). .
1972 August 13 - . 15:10 GMT - . Launch Site: Wallops Island. Launch Complex: Wallops Island LA3A. LV Family: Scout. Launch Vehicle: Scout D-1. Explorer 46 - . Payload: Meteoroid Technology Satellite. Mass: 136 kg (299 lb). Nation: USA. Agency: NASA Langley. Program: Explorer. Class: Earth. Type: Micrometeoroid satellite. Spacecraft: MTS. Decay Date: 1979-11-02 . USAF Sat Cat: 6142 . COSPAR: 1972-061A. Apogee: 811 km (503 mi). Perigee: 492 km (305 mi). Inclination: 37.70 deg. Period: 97.70 min. Micrometeoroid tests. Spacecraft engaged in research and exploration of the upper atmosphere or outer space (US Cat B). .
1972 September 2 - . 17:50 GMT - . Launch Site: Vandenberg. Launch Complex: Vandenberg SLC5. LV Family: Scout. Launch Vehicle: Scout B-1. Triad 1 - . Payload: TIP 1. Mass: 94 kg (207 lb). Nation: USA. Agency: USN. Program: Transit. Class: Navigation. Type: Navigation satellite. Spacecraft: TIP. USAF Sat Cat: 6173 . COSPAR: 1972-069A. Apogee: 792 km (492 mi). Perigee: 709 km (440 mi). Inclination: 90.00 deg. Period: 99.80 min. A Scout rocket launched from Vandenberg boosted an improved Navy navigation satellite (TRIAD OI-IX) into orbit. Prototype of improved Transit satellite..
1972 November 15 - . 22:13 GMT - . Launch Site: San Marco. LV Family: Scout. Launch Vehicle: Scout D-1. Explorer 48 - . Payload: SAS B. Mass: 185 kg (407 lb). Nation: USA. Agency: NASA Greenbelt. Program: Explorer. Class: Astronomy. Type: Solar satellite. Spacecraft: SAS. Decay Date: 1976-08-20 . USAF Sat Cat: 6282 . COSPAR: 1972-091A. Apogee: 526 km (326 mi). Perigee: 526 km (326 mi). Inclination: 1.00 deg. Period: 95.20 min. Spacecraft engaged in research and exploration of the upper atmosphere or outer space (US Cat B). .
1972 November 22 - . 00:17 GMT - . Launch Site: Vandenberg. Launch Complex: Vandenberg SLC5. LV Family: Scout. Launch Vehicle: Scout D-1. ESRO 4 - . Mass: 114 kg (251 lb). Nation: Europe. Agency: ESRO. Class: Technology. Type: Navigation technology satellite. Spacecraft: ESRO. Decay Date: 1974-04-15 . USAF Sat Cat: 6285 . COSPAR: 1972-092A. Apogee: 1,173 km (728 mi). Perigee: 245 km (152 mi). Inclination: 91.10 deg. Period: 99.00 min. Polar ionosphere investigations. Seventh ESRO satellite. Mass 115 kg. Also registered by the United States as 1972-92A, in A/AC.105/INF.267, with orbital parameters 98.8 min, 244 x 1160 km x 91.1 deg, category B. .
1972 December 16 - . 11:24 GMT - . Launch Site: Vandenberg. Launch Complex: Vandenberg SLC5. LV Family: Scout. Launch Vehicle: Scout D-1. Aeros 1 - . Payload: GRS B. Mass: 127 kg (279 lb). Nation: Germany. Agency: DFVLR. Class: Earth. Type: Magnetosphere satellite. Spacecraft: Aeros. Decay Date: 1973-08-22 . USAF Sat Cat: 6315 . COSPAR: 1972-100A. Apogee: 867 km (538 mi). Perigee: 223 km (138 mi). Inclination: 96.90 deg. Period: 95.60 min. Spacecraft engaged in research and exploration of the upper atmosphere or outer space (US Cat B). .
1973 October 30 - . 00:37 GMT - . Launch Site: Vandenberg. Launch Complex: Vandenberg SLC5. LV Family: Scout. Launch Vehicle: Scout A-1. Transit O-20 - . Mass: 58 kg (127 lb). Nation: USA. Agency: USN. Program: Transit. Class: Navigation. Type: Navigation satellite. Spacecraft: Transit. USAF Sat Cat: 6909 . COSPAR: 1973-081A. Apogee: 1,120 km (690 mi). Perigee: 885 km (549 mi). Inclination: 89.80 deg. Period: 105.20 min. Operational life over 20 years. SAMSO launched a Transit navigation Satellite into orbit from Vandenberg Air Force Base. It replaced a polar orbiting spacecraft which had ceased to operate..
1974 February 18 - . 10:05 GMT - . Launch Site: San Marco. LV Family: Scout. Launch Vehicle: Scout D-1. San Marco 4 - . Payload: San Marco C2. Mass: 164 kg (361 lb). Nation: Italy. Agency: CRS. Class: Earth. Type: Atmosphere satellite. Spacecraft: San Marco satellite. Decay Date: 1976-05-04 . USAF Sat Cat: 7154 . COSPAR: 1974-009A. Apogee: 875 km (543 mi). Perigee: 270 km (160 mi). Inclination: 2.90 deg. Period: 96.10 min. Measurement of density, temperature, composition of atmosphere. Launch time 10:05:28.5 GMT. Anticipated life: 3 years. .
1974 March 9 - . 02:22 GMT - . Launch Site: Vandenberg. Launch Complex: Vandenberg SLC5. LV Family: Scout. Launch Vehicle: Scout D-1. Miranda - . Payload: X-4. Mass: 93 kg (205 lb). Nation: UK. Agency: Royal Aerospace Establishment. Class: Technology. Type: Navigation technology satellite. Spacecraft: Miranda. USAF Sat Cat: 7213 . COSPAR: 1974-013A. Apogee: 866 km (538 mi). Perigee: 677 km (420 mi). Inclination: 97.90 deg. Period: 100.30 min. Satellite technology. Miranda was launched at 02:22:11.4 GMT on 1974 Mar 9. Interjection point 13.9N, 126.0E. Anticipated life: longer than 50 years. .
1974 June 3 - . 23:09 GMT - . Launch Site: Vandenberg. Launch Complex: Vandenberg SLC5. LV Family: Scout. Launch Vehicle: Scout E-1. Explorer 52 - . Payload: Hawkeye. Mass: 27 kg (59 lb). Nation: USA. Agency: NASA Langley. Program: Explorer. Class: Astronomy. Type: Solar satellite. Spacecraft: Hawkeye. Decay Date: 1978-04-30 . USAF Sat Cat: 7325 . COSPAR: 1974-040A. Apogee: 125,569 km (78,024 mi). Perigee: 469 km (291 mi). Inclination: 89.00 deg. Period: 3,032.00 min. Solar wind experiments. Spacecraft engaged in research and exploration of the upper atmosphere or outer space (US Cat B). .
1974 July 16 - . 11:51 GMT - . Launch Site: Vandenberg. Launch Complex: Vandenberg SLC5. LV Family: Scout. Launch Vehicle: Scout D-1. Aeros 2 - . Payload: Aeros B. Mass: 127 kg (279 lb). Nation: Germany. Agency: DFVLR. Class: Earth. Type: Magnetosphere satellite. Spacecraft: Aeros. Decay Date: 1975-09-25 . USAF Sat Cat: 7371 . COSPAR: 1974-055A. Apogee: 869 km (539 mi). Perigee: 224 km (139 mi). Inclination: 97.50 deg. Period: 95.60 min. Upper atmospheric research. Spacecraft engaged in research and exploration of the upper atmosphere or outer space (US Cat B). .
1974 August 30 - . 14:07 GMT - . Launch Site: Vandenberg. Launch Complex: Vandenberg SLC5. LV Family: Scout. Launch Vehicle: Scout D-1. FAILURE: Partial Failure.. Failed Stage: 4. ANS 1 - . Mass: 129 kg (284 lb). Nation: Netherlands. Agency: NIVR. Class: Astronomy. Type: X-ray astronomy satellite. Spacecraft: ANS. Decay Date: 1977-06-14 . USAF Sat Cat: 7427 . COSPAR: 1974-070A. Apogee: 1,173 km (728 mi). Perigee: 258 km (160 mi). Inclination: 98.00 deg. Period: 99.10 min. Astronomical Netherlands Satellite; lower than planned orbit. .
1974 October 15 - . 07:47 GMT - . Launch Site: San Marco. LV Family: Scout. Launch Vehicle: Scout B-1. Ariel 5 - . Payload: UK 5. Mass: 129 kg (284 lb). Nation: UK. Agency: SRC. Class: Earth. Type: Magnetosphere satellite. Spacecraft: Ariel. Decay Date: 1980-03-14 . USAF Sat Cat: 7471 . COSPAR: 1974-077A. Apogee: 549 km (341 mi). Perigee: 504 km (313 mi). Inclination: 2.90 deg. Period: 94.90 min. X-ray observatory. Cosmic X-ray astronomy. Injection point: 2.7S, 58.2E. Anticipated life: 5 years. Time of launch: 07:47:00.25 GMT. Decay also (belatedly) noted in ST/SG/SER.E/216. .
1975 May 7 - . 22:45 GMT - . Launch Site: San Marco. LV Family: Scout. Launch Vehicle: Scout F-1. Explorer 53 - . Payload: SAS C. Mass: 195 kg (429 lb). Nation: USA. Agency: NASA Greenbelt. Program: Explorer. Class: Astronomy. Type: Solar satellite. Spacecraft: SAS. Decay Date: 1979-04-09 . USAF Sat Cat: 7788 . COSPAR: 1975-037A. Apogee: 507 km (315 mi). Perigee: 498 km (309 mi). Inclination: 3.00 deg. Period: 94.70 min. Spacecraft engaged in research and exploration of the upper atmosphere or outer space (US Cat B). .
1975 October 12 - . 06:39 GMT - . Launch Site: Vandenberg. Launch Complex: Vandenberg SLC5. LV Family: Scout. Launch Vehicle: Scout D-1. Triad 2 - . Payload: TIP 2. Mass: 94 kg (207 lb). Nation: USA. Agency: USN. Program: Transit. Class: Navigation. Type: Navigation satellite. Spacecraft: TIP. Decay Date: 1991-05-26 . USAF Sat Cat: 8361 . COSPAR: 1975-099A. Apogee: 490 km (300 mi). Perigee: 427 km (265 mi). Inclination: 90.40 deg. Period: 93.80 min. A Scout vehicle carrying a Transit Improvement Program payload was launched from SLC-5, Western Test Range. Launch was successful, but the solar panels of the satellite failed to deploy after the satellite had reached orbit. Prototype of improved Transit satellite. Tested pulsed plasma engine. 1975 December 6 - . 03:35 GMT - . Launch Site: Vandenberg. Launch Complex: Vandenberg SLC5. LV Family: Scout. Launch Vehicle: Scout F-1. FAILURE: Failure. Failed Stage: U.
Explorer (56) - . Payload: DAD-A. Mass: 71 kg (156 lb). Nation: USA. Agency: NASA. Program: Explorer. Class: Earth. Type: Atmosphere satellite. Spacecraft: DAD. Decay Date: 1975-12-05 . Dual Air Density; air density experiments..
DAD-B - . Payload: DAD-B. Mass: 71 kg (156 lb). Nation: USA. Agency: USAF AFSC. Program: Explorer. Spacecraft: DAD. 1976 May 22 - . 07:42 GMT - . Launch Site: Vandenberg. Launch Complex: Vandenberg SLC5. LV Family: Scout. Launch Vehicle: Scout B-1. P 76-5 - . Mass: 73 kg (160 lb). Nation: USA. Agency: USAF STP. Class: Technology. Type: Communications technology satellite. Spacecraft Bus: P. Spacecraft: P 76. USAF Sat Cat: 8860 . COSPAR: 1976-047A. Apogee: 1,044 km (648 mi). Perigee: 981 km (609 mi). Inclination: 99.60 deg. Period: 105.40 min. A Scout vehicle carrying a Space Test Program spacecraft was successfully launched from SLC-5 at the Western Test Range. The spacecraft, Flight P76-5, carried a wideband signals experiment sponsored by the Defense Nuclear Agency. Communications propagation experiments. 1976 June 18 - . 11:41 GMT - . Launch Site: Wallops Island. Launch Complex: Wallops Island LA3A. LV Family: Scout. Launch Vehicle: Scout D-1. GP-A Physics mission - . Nation: USA. Agency: NASA. Apogee: 10,230 km (6,350 mi). 1976 September 1 - . 21:14 GMT - . Launch Site: Vandenberg. Launch Complex: Vandenberg SLC5. LV Family: Scout. Launch Vehicle: Scout D-1. TIP 3 - . Payload: Triad 3 (TIP 3). Mass: 94 kg (207 lb). Nation: USA. Agency: USN. Program: Transit. Class: Navigation. Type: Navigation satellite. Spacecraft: TIP. Decay Date: 1981-05-30 . USAF Sat Cat: 9403 . COSPAR: 1976-089A. Apogee: 789 km (490 mi). Perigee: 345 km (214 mi). Inclination: 90.30 deg. Period: 95.90 min. A Scout vehicle carrying a Transit Improvement Program payload was launched from SLC-5, Western Test Range. Launch was successful, but the solar panels of the satellite failed to deploy after the satellite had reached orbit. Prototype of improved Transit satellite. Also tested pulsed plasma engine. 1977 April 19 - . Launch Site: , Vandenberg. LV Family: Scout. Scout launches at Vandenberg AFB - . Responsibility for directing Scout launches at Vandenberg AFB was transferred from the Air Force to NASA..
1977 October 28 - . 04:52 GMT - . Launch Site: Vandenberg. Launch Complex: Vandenberg SLC5. LV Family: Scout. Launch Vehicle: Scout D-1. Transat O-11 - . Mass: 94 kg (207 lb). Nation: USA. Agency: USN. Program: Transit. Class: Navigation. Type: Navigation satellite. Spacecraft: Transit. USAF Sat Cat: 10457 . COSPAR: 1977-106A. Apogee: 1,097 km (681 mi). Perigee: 1,059 km (658 mi). Inclination: 89.70 deg. Period: 106.80 min. Modification of first APL-built operational Transit for 'related experiments'..
1978 April 26 - . 10:20 GMT - . Launch Site: Vandenberg. Launch Complex: Vandenberg SLC5. LV Family: Scout. Launch Vehicle: Scout D-1. HCMM - . Payload: AEM 1. Mass: 134 kg (295 lb). Nation: USA. Agency: NASA Greenbelt. Class: Earth. Type: Atmosphere satellite. Spacecraft: AEM. Decay Date: 1981-12-22 . USAF Sat Cat: 10818 . COSPAR: 1978-041A. Apogee: 641 km (398 mi). Perigee: 560 km (340 mi). Inclination: 97.60 deg. Period: 96.70 min. Heat Capacity Mapping Mission; prodeuced thermal maps of atmosphere. Spacecraft engaged in practical applications and uses of space technology such as weather or communication (US Cat C). .
1979 February 18 - . 16:18 GMT - . Launch Site: Wallops Island. Launch Complex: Wallops Island LA3A. LV Family: Scout. Launch Vehicle: Scout D-1. SAGE - . Payload: AEM 2. Mass: 147 kg (324 lb). Nation: USA. Agency: NASA Greenbelt. Class: Earth. Type: Atmosphere satellite. Spacecraft: SAGE. Decay Date: 1989-04-11 . USAF Sat Cat: 11270 . COSPAR: 1979-013A. Apogee: 506 km (314 mi). Perigee: 456 km (283 mi). Inclination: 55.00 deg. Period: 94.20 min. Studied dust, liquid droplets in upper atmosphere. Spacecraft engaged in practical applications and uses of space technology such as weather or communication (US Cat C). .
1979 June 2 - . 23:26 GMT - . Launch Site: Wallops Island. Launch Complex: Wallops Island LA3A. LV Family: Scout. Launch Vehicle: Scout D-1. Ariel 6 - . Payload: UK 6. Mass: 154 kg (339 lb). Nation: UK. Agency: SRC. Class: Earth. Type: Magnetosphere satellite. Spacecraft: Ariel. Decay Date: 1990-09-23 . USAF Sat Cat: 11382 . COSPAR: 1979-047A. Apogee: 383 km (237 mi). Perigee: 372 km (231 mi). Inclination: 55.00 deg. Period: 92.10 min. Detection of heavy cosmic particles and X-ray astronomy. Launch time 2326 GMT. Also registered by the United States in ST/SG/SER.E/26, with parameters 97.2 min, 601 x 653 km x 55.0 deg, category A. .
1979 October 30 - . 14:16 GMT - . Launch Site: Vandenberg. Launch Complex: Vandenberg SLC5. LV Family: Scout. Launch Vehicle: Scout G-1. Magsat - . Payload: AEM 3. Mass: 181 kg (399 lb). Nation: USA. Agency: NASA Greenbelt. Class: Earth. Type: Magnetosphere satellite. Spacecraft: Magsat. Decay Date: 1980-06-11 . USAF Sat Cat: 11604 . COSPAR: 1979-094A. Apogee: 561 km (348 mi). Perigee: 352 km (218 mi). Inclination: 96.80 deg. Period: 93.70 min. Measured near-Earth magnetic field and crustal anomalies. Spacecraft engaged in practical applications and uses of space technology such as weather or communication (US Cat C). .
1981 May 15 - . 06:07 GMT - . Launch Site: Vandenberg. Launch Complex: Vandenberg SLC5. LV Family: Scout. Launch Vehicle: Scout G-1. Nova 1 - . Mass: 170 kg (370 lb). Nation: USA. Agency: USN. Program: Transit. Class: Navigation. Type: Navigation satellite. Spacecraft: TIP. USAF Sat Cat: 12458 . COSPAR: 1981-044A. Apogee: 1,185 km (736 mi). Perigee: 1,165 km (723 mi). Inclination: 90.20 deg. Period: 108.90 min. Improved Transit..
1983 June 27 - . 15:37 GMT - . Launch Site: Vandenberg. Launch Complex: Vandenberg SLC5. LV Family: Scout. Launch Vehicle: Scout D-1. HILAT - . Payload: Transit O-16 / P83-1. Mass: 55 kg (121 lb). Nation: USA. Agency: USAF STP. Class: Communications. Type: Military communications satellite. Spacecraft: Transit. USAF Sat Cat: 14154 . COSPAR: 1983-063A. Apogee: 818 km (508 mi). Perigee: 754 km (468 mi). Inclination: 82.00 deg. Period: 100.60 min. Modification of Transit O-16 for military communications research. Officially: Spacecraft engaged in practical applications and uses of space technology such as weather or communication (US Cat C)..
1984 October 12 - . 01:43 GMT - . Launch Site: Vandenberg. Launch Complex: Vandenberg SLC5. LV Family: Scout. Launch Vehicle: Scout G-1. Nova 3 - . Mass: 165 kg (363 lb). Nation: USA. Agency: USN. Program: Transit. Class: Navigation. Type: Navigation satellite. Spacecraft: TIP. USAF Sat Cat: 15362 . COSPAR: 1984-110A. Apogee: 1,200 km (700 mi). Perigee: 1,152 km (715 mi). Inclination: 89.90 deg. Period: 108.90 min. Improved Transit. Pulsed plasma engine..
1985 August 3 - . 03:31 GMT - . Launch Site: Vandenberg. Launch Complex: Vandenberg SLC5. LV Family: Scout. Launch Vehicle: Scout G-1. Transit O-24 - . Mass: 55 kg (121 lb). Nation: USA. Agency: USN. Program: Transit. Class: Navigation. Type: Navigation satellite. Spacecraft: Transit. USAF Sat Cat: 15935 . COSPAR: 1985-066A. Apogee: 1,254 km (779 mi). Perigee: 1,000 km (600 mi). Inclination: 89.90 deg. Period: 107.90 min. First operational Transits launched in 12 years due to reliability of original constellation. First paired Transit launch.. Transit O-30 - . Mass: 55 kg (121 lb). Nation: USA. Agency: USN. Program: Transit. Class: Navigation. Type: Navigation satellite. Spacecraft: Transit. USAF Sat Cat: 15936 . COSPAR: 1985-066B. Apogee: 1,255 km (779 mi). Perigee: 999 km (620 mi). Inclination: 89.90 deg. Period: 107.90 min. 1985 December 13 - . 02:35 GMT - . Launch Site: Wallops Island. Launch Complex: Wallops Island LA3A. LV Family: Scout. Launch Vehicle: Scout G-1. USA 13 - . Payload: ITV 1 ASAT Balloon Target. Nation: USA. Agency: USAF. Class: Military. Type: Anti-satellite system target. Spacecraft: ITV. Decay Date: 1989-05-11 . USAF Sat Cat: 16328 . COSPAR: 1985-114A. Apogee: 691 km (429 mi). Perigee: 311 km (193 mi). Inclination: 37.10 deg. Period: 94.60 min. Target balloon for F-15-launched ASAT missile. The battery-powered vehicle remained uninflated in orbit until a test was planned. Orbital decay data indicated the balloon was never inflated. It decayed without an intercept being attempted..
ITV 1 Balloon - . Payload: ITV 1 Balloon. Nation: USA. Agency: USAF. Class: Military. Type: Anti-satellite system target. Spacecraft: ITV. Decay Date: 1987-03-02 . USAF Sat Cat: 17247 . COSPAR: 1985-114D. Apogee: 737 km (457 mi). Perigee: 310 km (190 mi). Inclination: 37.00 deg. Period: 95.10 min. USA 14 - . Payload: ITV 2 ASAT Balloon Target. Nation: USA. Agency: USAF. Class: Military. Type: Anti-satellite system target. Spacecraft: ITV. Decay Date: 1987-08-09 . USAF Sat Cat: 16329 . COSPAR: 1985-114B. Apogee: 450 km (270 mi). Perigee: 284 km (176 mi). Inclination: 37.10 deg. Period: 91.90 min. Target balloon for F-15-launched ASAT missile. The battery-powered vehicle remained uninflated in orbit until a test was planned. Orbital decay data indicates the balloon was inflated on 18 December 1986. However for operational or political reasons no intercept was ever attempted. ITV 1 Balloon - . Nation: USA. Agency: NASA. Class: Military. Type: Anti-satellite system target. Spacecraft: ITV. Decay Date: 1989-05-11 . USAF Sat Cat: 16328 . COSPAR: 1985-114xx. Apogee: 160 km (90 mi). Perigee: 148 km (91 mi). Inclination: 37.00 deg. Period: 87.60 min. 1986 November 14 - . 00:23 GMT - . Launch Site: Vandenberg. Launch Complex: Vandenberg SLC5. LV Family: Scout. Launch Vehicle: Scout G-1. Polar Bear - . Payload: Transit O-16 / P 87-1. Mass: 125 kg (275 lb). Nation: USA. Agency: USAF STP. Class: Earth. Type: Magnetosphere satellite. Spacecraft: Transit. USAF Sat Cat: 17070 . COSPAR: 1986-088A. Apogee: 1,013 km (629 mi). Perigee: 955 km (593 mi). Inclination: 89.60 deg. Period: 104.80 min. Tranist O-17 had been turned over to the National Air and Space Museum in 1976 and was displayed to the public for more than 8 years. In 1984, it was refurbished at APL and launched as the Polar Beacon Experiment and Auroral Research satellite to collect data for studying communications over the Earth's polar regions. 1987 September 16 - . 19:22 GMT - . Launch Site: Vandenberg. Launch Complex: Vandenberg SLC5. LV Family: Scout. Launch Vehicle: Scout G-1. Transit O-27 - . Mass: 59 kg (130 lb). Nation: USA. Agency: USN. Program: Transit. Class: Navigation. Type: Navigation satellite. Spacecraft: Transit. USAF Sat Cat: 18361 . COSPAR: 1987-080A. Apogee: 1,174 km (729 mi). Perigee: 1,016 km (631 mi). Inclination: 90.30 deg. Period: 107.20 min. Dual launch of operational Transits manufactured in the 1960's to replenish the constellation.. Transit O-29 - . Mass: 59 kg (130 lb). Nation: USA. Agency: USN. Program: Transit. Class: Navigation. Type: Navigation satellite. Spacecraft: Transit. USAF Sat Cat: 18362 . COSPAR: 1987-080B. Apogee: 1,177 km (731 mi). Perigee: 1,016 km (631 mi). Inclination: 90.30 deg. Period: 107.20 min. 1988 March 25 - . 19:50 GMT - . Launch Site: San Marco. LV Family: Scout. Launch Vehicle: Scout G-1. San Marco D/L - . Payload: San Marco 5. Mass: 236 kg (520 lb). Nation: Italy. Agency: ASI. Class: Earth. Type: Atmosphere satellite. Spacecraft: San Marco satellite. Decay Date: 1988-12-06 . USAF Sat Cat: 19013 . COSPAR: 1988-026A. Apogee: 625 km (388 mi). Perigee: 268 km (166 mi). Inclination: 3.00 deg. Period: 93.50 min. Upper atmosphere studies; US, France, Italy participation. .
1988 April 26 - . 01:57 GMT - . Launch Site: Vandenberg. Launch Complex: Vandenberg SLC5. LV Family: Scout. Launch Vehicle: Scout G-1. Transit O-23 - . Mass: 64 kg (141 lb). Nation: USA. Agency: USN. Program: Transit. Class: Navigation. Type: Navigation satellite. Spacecraft: Transit. USAF Sat Cat: 19070 . COSPAR: 1988-033A. Apogee: 1,301 km (808 mi). Perigee: 1,016 km (631 mi). Inclination: 90.40 deg. Period: 108.50 min. Dual launch of operational Transits manufactured in the 1960's to replenish the constellation.. Transit O-32 - . Mass: 64 kg (141 lb). Nation: USA. Agency: USN. Program: Transit. Class: Navigation. Type: Navigation satellite. Spacecraft: Transit. USAF Sat Cat: 19071 . COSPAR: 1988-033B. Apogee: 1,298 km (806 mi). Perigee: 1,017 km (631 mi). Inclination: 90.40 deg. Period: 108.50 min. 1988 June 16 - . 06:54 GMT - . Launch Site: Vandenberg. Launch Complex: Vandenberg SLC5. LV Family: Scout. Launch Vehicle: Scout G-1. Nova 2 - . Mass: 174 kg (383 lb). Nation: USA. Agency: USN. Program: Transit. Class: Navigation. Type: Navigation satellite. Spacecraft: TIP. USAF Sat Cat: 19223 . COSPAR: 1988-052A. Apogee: 1,198 km (744 mi). Perigee: 1,154 km (717 mi). Inclination: 90.10 deg. Period: 108.90 min. Improved Transit. Pulsed plasma thruster. 1988 August 25 - . 06:59 GMT - . Launch Site: Vandenberg. Launch Complex: Vandenberg SLC5. LV Family: Scout. Launch Vehicle: Scout G-1. Transit O-25 - . Mass: 59 kg (130 lb). Nation: USA. Agency: USN. Program: Transit. Class: Navigation. Type: Navigation satellite. Spacecraft: Transit. USAF Sat Cat: 19419 . COSPAR: 1988-074A. Apogee: 1,176 km (730 mi). Perigee: 1,032 km (641 mi). Inclination: 89.80 deg. Period: 107.30 min. Dual launch of operational Transits manufactured in the 1960's to replenish the constellation.. Transit O-31 - . Mass: 59 kg (130 lb). Nation: USA. Agency: USN. Program: Transit. Class: Navigation. Type: Navigation satellite. Spacecraft: Transit. USAF Sat Cat: 19420 . COSPAR: 1988-074B. Apogee: 1,174 km (729 mi). Perigee: 1,032 km (641 mi). Inclination: 89.80 deg. Period: 107.30 min. 1990 May 9 - . 17:50 GMT - . Launch Site: Vandenberg. Launch Complex: Vandenberg SLC5. LV Family: Scout. Launch Vehicle: Scout G-1. Macsat 1; M-1 - . Payload: MacSat 1. Mass: 68 kg (149 lb). Nation: USA. Agency: DARPA. Class: Communications. Type: Military communications satellite. Spacecraft Bus: MAESTRO. Spacecraft: Macsat. USAF Sat Cat: 20607 . COSPAR: 1990-043A. Apogee: 753 km (467 mi). Perigee: 602 km (374 mi). Inclination: 89.90 deg. Period: 98.30 min. Multiple Access Communications Satellite; global store and forward communications. Spacecraft engaged in research and exploration of the upper atmosphere or outer space (US Cat B)..
Macsat 2; M-2 - . Payload: MacSat 2. Mass: 68 kg (149 lb). Nation: USA. Agency: DARPA. Class: Communications. Type: Civilian communications satellite. Spacecraft Bus: MAESTRO. Spacecraft: Macsat. USAF Sat Cat: 20608 . COSPAR: 1990-043B. Apogee: 749 km (465 mi). Perigee: 600 km (370 mi). Inclination: 89.90 deg. Period: 98.30 min. Multiple Access Communications Satellite; global store and forward communications. Spacecraft engaged in research and exploration of the upper atmosphere or outer space (US Cat B)..
1991 June 29 - . 14:00 GMT - . Launch Site: Vandenberg. Launch Complex: Vandenberg SLC5. LV Family: Scout. Launch Vehicle: Scout G-1. REX - . Payload: REX 1. Mass: 85 kg (187 lb). Nation: USA. Agency: USAF Rome. Class: Earth. Type: Ionosphere satellite. Spacecraft Bus: GemStar. Spacecraft: REX. USAF Sat Cat: 21527 . COSPAR: 1991-045A. Apogee: 869 km (539 mi). Perigee: 767 km (476 mi). Inclination: 89.50 deg. Period: 101.30 min. Radiation Experiment; tested communications components in high radiation environment. Spacecraft engaged in research and exploration of the upper atmosphere or outer space (US Cat B)..
1992 July 3 - . 14:19 GMT - . Launch Site: Vandenberg. Launch Complex: Vandenberg SLC5. LV Family: Scout. Launch Vehicle: Scout G-1. SAMPEX - . Mass: 158 kg (348 lb). Nation: USA. Agency: NASA Greenbelt. Program: Small Explorer. Class: Earth. Type: Magnetosphere satellite. Spacecraft: SAMPEX. Decay Date: 2012-11-13 . USAF Sat Cat: 22012 . COSPAR: 1992-038A. Apogee: 670 km (410 mi). Perigee: 506 km (314 mi). Inclination: 81.70 deg. Period: 96.50 min. First Small Explorer mission; Solar Anomalous and Magnetospheric Particle Explorer. Spacecraft engaged in research and exploration of the upper atmosphere or outer space (US Cat B)..
1992 November 21 - . 13:45 GMT - . Launch Site: Vandenberg. Launch Complex: Vandenberg SLC5. LV Family: Scout. Launch Vehicle: Scout G-1. MSTI - . Payload: MSTI 1. Mass: 180 kg (390 lb). Nation: USA. Class: Military. Type: Strategic defense satellite. Spacecraft Bus: SA-200. Spacecraft: MSTI. Decay Date: 1993-07-18 . USAF Sat Cat: 22229 . COSPAR: 1992-078A. Apogee: 366 km (227 mi). Perigee: 289 km (179 mi). Inclination: 96.70 deg. Period: 91.10 min. BMDO technology demonstration; Miniature Seeker Technology Demonstration. Spacecraft engaged in research and exploration of the upper atmosphere or outer space (US Cat B). .
1993 June 25 - . 23:30 GMT - . Launch Site: Vandenberg. Launch Complex: Vandenberg SLC5. LV Family: Scout. Launch Vehicle: Scout G-1. Radcal - . Mass: 95 kg (209 lb). Nation: USA. Agency: USAF. Class: Surveillance. Type: Radar calibration target. Spacecraft: Radcal. USAF Sat Cat: 22698 . COSPAR: 1993-041A. Apogee: 882 km (548 mi). Perigee: 753 km (467 mi). Inclination: 89.60 deg. Period: 101.20 min. Radar calibration. Spacecraft engaged in practical applications and uses of space technology such as weather or communication (US Cat C). .
1994 May 9 - . 02:47 GMT - . Launch Site: Vandenberg. Launch Complex: Vandenberg SLC5. LV Family: Scout. Launch Vehicle: Scout G-1. MSTI-2 - . Payload: MSTI 2. Mass: 163 kg (359 lb). Nation: USA. Class: Military. Type: Strategic defense satellite. Spacecraft Bus: SA-200. Spacecraft: MSTI. Decay Date: 1998-11-28 . USAF Sat Cat: 23101 . COSPAR: 1994-028A. Apogee: 433 km (269 mi). Perigee: 415 km (257 mi). Inclination: 93.10 deg. Period: 97.10 min. Last Scout launch; BMDO technology tests. Space craft engaged in investigation of spaceflight techniques and technology (US Cat A). .